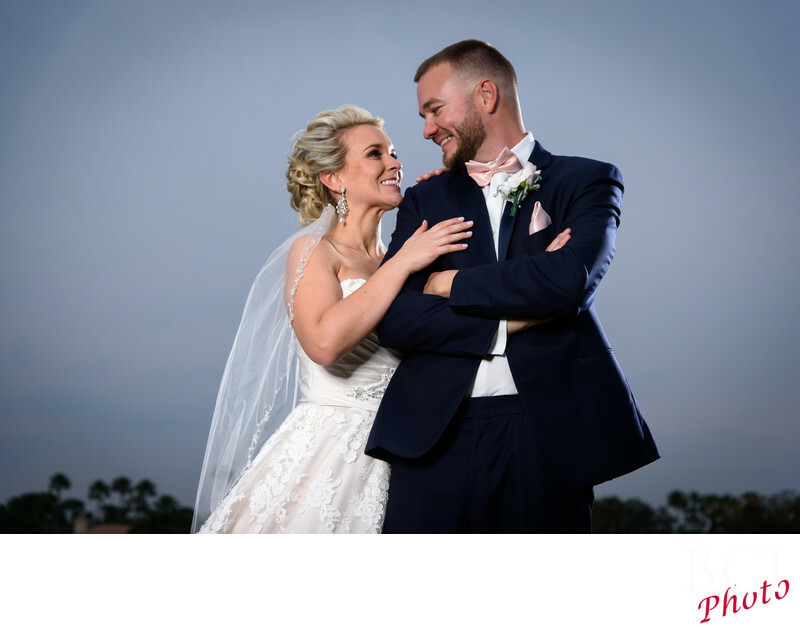 This romantic wedding portrait was taken at the fabulous willoughby golf club in stuart florida. A couple things that really made this image stand our for us was the dynamic lighting which is entirely provided by us. This couple ran behind, and by the time we were able to get out to actually do these shots, the sun was long gone. Not to fear however, as we provided our own. Here we had one light front left, and another studio quality light from behind the groom which really sets them apart from our background. We chose a very low camera angle here specifically to isolate them on a clean sky background (thereby elimination the homes that are behind them). Its this kind of attention to detail, and effort that we focus on to really make your wedding portrait session result in a set of fantastic bridal portraits that you'd love to hang on your walls! The other thing that really shines in this wedding portrait, is the way we have posed our couple so they are completely engaged with each other. You can feel the love in their eyes as we prefer to capture. Sure we take images where they look at the camera as well. (grandma loves those too of course), but quite often it's the ones where our couple are gazing into each others eyes rather than ours. An added touch, is the way she her hand tenderly touches his chest. All in all one of our favorite captures from this wedding. Want images like this for your wedding? Why not call or text us right now! Brads Creative Images photography is located at 698 sw PSL Blvd in PSL Florida 34953. Which is about 30 seconds off of the Florida Turnpike entrance.